Cannabis marketing: Searching for a guide to help you with your cannabis marketing and strategy? This insider's guide for marijuana marketing helps businesses with helpful marketing ideas. This guide includes helpful examples and resources to start growing your business. The Insider's Guide to Cannabis and CBD Marketing, Advertising, and Website Development! Companies that market and sell cannabis and CBD products face unique challenges in staying compliant with regulations. And let's not even talk about how often those regulations change requiring shifts to your business. The last thing you want to be worried about is where your next lead and business growth is coming from. A marketing and advertising strategy can help you stay on the radar of your customers and keep them coming back to you as the marketplace becomes more and more crowded as interest grows for the products. This guide will take you through the steps necessary to build out a dynamic marketing plan to grow your business and sustain it long term, no matter what happens with the regulations around your products. Let’s start building out your marketing plan for sustained income and customer interest so you can maximize your profits and grow your business. Generating leads regularly means you don't have to worry about where your business and income will come from this month. You should have constant awareness drivers that serve to bring people in who have an interest in your product. Campaigns are great, but they tend to be short-term, whereas constant awareness drivers are your “always on” marketing tactics. You have both earned and bought media to work with. Your earned media is attention that you get from search engines and your social media following (both without paying for ads). Your bought strategies include purchasing ads to get more interest in your products. This can consist of advertisements on search engines so that your business is the first thing a person sees when they search for related products. It can also be social media ads where you show up within people's newsfeeds with helpful information about why they might use your products. Let’s look closer at a variety of strategies for generating leads. Cannabis marketing starts with a strong online strategy including google my business. Cannabis sales have so many regulations that you must complete the sale in store. That doesn’t mean that consumers won’t begin their search online though. To find your retail location, consumers will complete a search online to find convenient store locations near them. If you want to make it onto that consideration list, you need to be there alongside your peers. Ultimately, location and convenience will play a significant role in someone's decision to visit your store so let’s create a strategy for how to be there when customers look for a business like yours. Here are the main areas you need to place your focus to improve your local SEO. Google My Business provides you the opportunity to show up on a map listing for businesses just like yours when someone completes a local search. Local search terms in your city and state, near me, close by, etc. 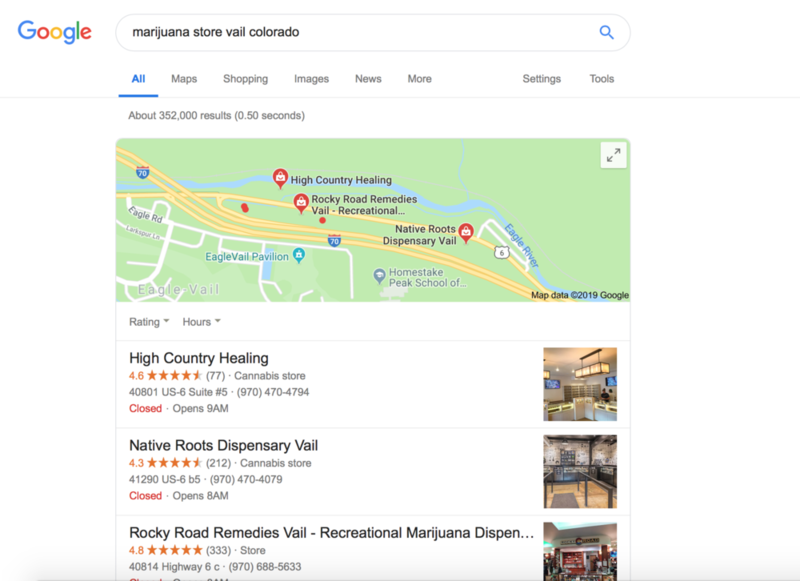 Google makes it simple to click on an address for a store and get directions, which makes this a highly sought-after location within a search engine. To get on this page, you need to claim your Google My Business listing. Your business might already be listed, thanks to Google's algorithms that pull from online information, or you might need to create your listing. Log into your Google account and search your store. If it appears, you can claim it and if not, create a listing. To confirm your business information, you can receive a postcard in the mail to your business address with a custom code that you input on the back end of the platform to prove you are who you say you are. Now that you own your listing, you can keep it up to date with updated contact information and monitor what’s being said about you on the reviews section. Search engines love consistency. A consistent address, phone number and company name across all listings help a search engine tie all of your mentions together. Create a document where you list out exactly how you'll input your company information on your social media, Google My Business, and industry websites to ensure this consistency. Once your information is consistent, a search engine can tie it all together as one business so that you have improved local search rankings. Reviews don't affect your ranking all that much, but they do change how a potential customer views you next to your competitors in local search. If you have a 4.7-star rating and your competitor across the street has a 4-star rating, a customer is more likely to choose you. After you complete a sale, invite your customers to leave you a review. This can be through a follow-up email or social media post. You can also ask your staff to encourage it at the point of sale in your store. There are directory websites for the industry that help potential customers find your business. Having multiple trusted websites where your company information is listed helps your local search ranking. The more times a search engine sees your information, the more trusted you become and higher you rank. Links to your website from other trusted websites are like a referral telling a search engine that your website should be trusted. Take some time to research industry websites that list marijuana businesses and get your business listed. Your online strategy starts and ends with your company website. You need your website to be optimized for local search. List your location information in your website footer. If you have multiple locations, it can be helpful to have a page for each to be searchable in each area. Outside of the obvious local search strategies of getting your location information out there, you also need to pay attention to your site speed and mobile optimization. Google offers PageSpeed Insights to help you evaluate areas of opportunity for your website. Dispensary marketing Reputation management for marijuana and cbd companies. In the last section, we encouraged you to open your Google My Business listing and ask your customers to review you. Now that your business is listed out there, you need to monitor what’s being said in those reviews and responding accordingly. Many businesses fear opening up reviews because of the negative things people might say about them online. This is a legitimate fear, but it shouldn’t keep you from allowing customers to leave you a review. You will get a negative review here and there or a review that you disagree with. Don’t let that keep you from maximizing your online marketing potential through reviews. To manage your reputation, you should respond to reviews on a timely basis. For the really great reviews, take the time to thank the customer for the kind words. These individuals can become promoters for your business who share what they love about you with their friends and family. You want to encourage them to keep sharing their experience onward so that you can keep gaining awareness in the marketplace. On negative reviews, you should be responding and doing what you can to make it right. Some customers don’t really want you to make it right; they just want a place to vent and feel heard. Regardless, you need to make it public that you strive for customer satisfaction in all interactions. Your response to negative reviews should be honest, apologetic when warranted and accommodating. Try to get your customer to come back and try your business again to give you another chance. Even if they don't try to minimize the effect the negative review has on your online reputation. Simply responding to negative reviews makes you look empathetic and customer-centric. Let’s review a sample of a way Rocky Road Remedies responded to a customer with some negative feedback. How to Do Reputation management for marijuana and cbd companies. “Hello!! Thank you so much for the rating and review! The response aims at informing the customer as to why they use certain practices in store. Ultimately, it's a quality assurance tactic, which ensures a better product and better experience for the customer. The response is good because it doesn't make the customer seem ignorant or unreasonable; it just explains a business practice. On good reviews, the shop answers appropriately as well. Here's a look at a straightforward review and its response. “Thank you so much Nate, we truly appreciate the review! It isn’t lengthy or complicated. The response from the owner acknowledges the positivity and thanks them for the time in sharing their experience. Social media provides an opportunity to build a brand voice and stay in your audience’s consideration set when looking to buy the products you sell. Each social media platform has rules and regulations around ads and promotions for recreational drug use. You should familiarize yourself with those regulations for each platform before launching a campaign, especially a paid advertisement as it may be disapproved. Each social media platform has its strengths when it comes to marketing your business. Here's a look at how to use each platform to its full advantage. Cannabis marketing on instagram and social media guide. Instagram is an excellent platform for sharing images and short videos. You can turn your reviews from Google into graphics to promote your business, share quotes or sayings, and share pictures of your product or people using your product. One of the primary ways that companies use Instagram is tapping the potential of influencer marketing. Influencers have a following based on a topic that they are seen as experts in. Companies then work with those individuals to promote their brand to their followers. One Instagram account that shares a nice mix of content is High Times Magazine (@hightimesmagazine). The posts on the account sprinkle in video every 10 posts or so and feature a variety of content from snapshots of article headers on their website to entice you to read more to images of harvesting the plants. Much like Instagram, images and video drive Facebook engagement. Facebook is also beneficial for posting links to articles and information since links are clickable within Facebook. Your Facebook page is also like a mini website because you can create custom tabs on your business page to link out to your website, email sign up, etc. Post your address and contact information so that it’s easy to find your store and get in touch. 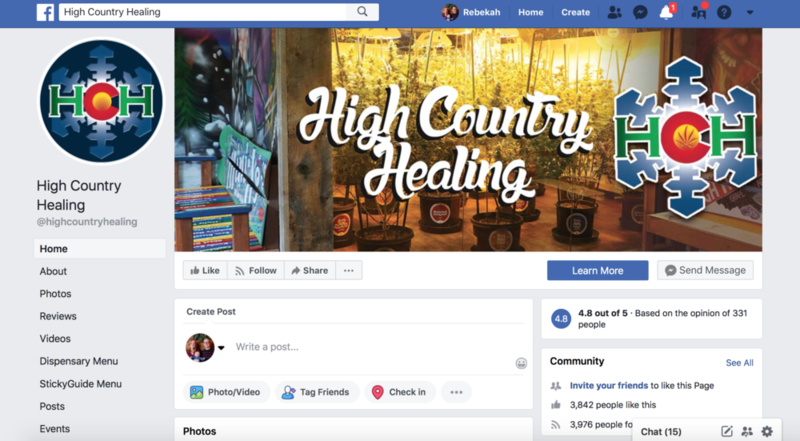 High Country Healing has multiple locations and uses their Facebook to share information about harvest, convention booths, apparel sales and more. The page mixes up their content types, which helps find the right content that resonates with your audience. By selling apparel, High Country Healing monetizes their social media presence and can grow their following in the area when others see people wearing the apparel. 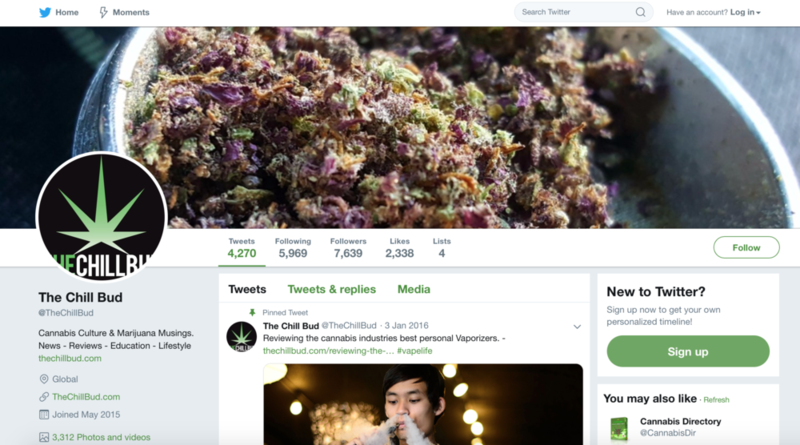 Twitter can be a strategic part of your cannabis marketing plan. Twitter offers a place where you can categorize your content under hashtags and earn new followers by posting about trending topics. With clickable links in the platform, you can share your thought leadership, recipes or website links with your audience to provide helpful information. One Twitter profile that does well is The Chill Bud (@TheChillBud). The profile reviews different ways to use marijuana and memes and graphics to highlight the industry. The Chill Bud shares a variety of content from their website and others to showcase their expertise. Marijuana marketing should include pinterest in the marketing plan. Pinterest offers a way to categorize content under different boards for your followers to access and share on with their audience. Your images on Pinterest can link out to your website or blog articles to showcase your knowledge on the topic. This social media platform is especially popular with women, so it's an excellent way to reach that audience. 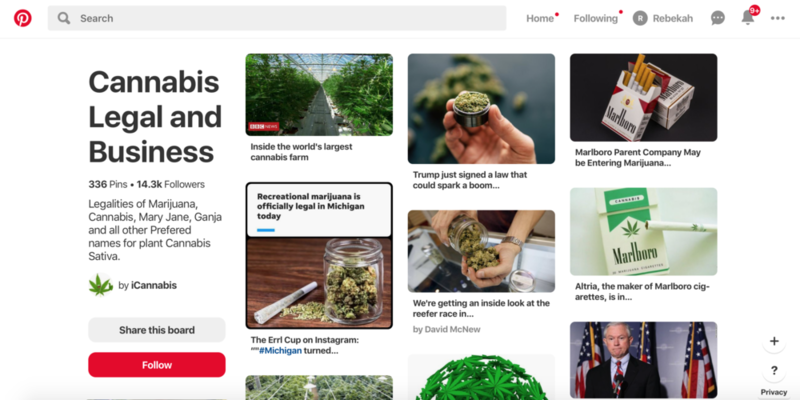 One cannabis Pinterest profile with a strong following and boards is iCannibis. The profile highlights news around the topic and helpful information on regulations and changes for both sellers of the product and consumers. Your online SEO strategy should include blog articles. Blogs make it possible for people to find you and showcase your expertise in the industry. Search engines also favor websites that are updated regularly, and blog articles can provide those regular updates. Blog articles can also provide an added value for your current customers. Share tips on how to use your products to keep customers coming back for more. Your blog should feature a variety of content from recipes to regulation updates. You want to be the go-to place for your customers to learn more. Plan to write no less than one blog article per month. Build out a content calendar that plans out a variety of different kinds of content and a distribution plan to get that content in front of your audience. You should send your blog posts out to your email distribution list and post them to your social media channels. Your blog should be integrated with your website and not on a standalone platform or separate domain name. By keeping your blog articles on your website, you maximize the visits to your main domain and enhance your SEO through keywords and information. Loyal customers make your job of marketing your store so much easier. Once you have a customer, your goal is to keep them coming back. The marketing that you do for current customers versus new customers does vary a bit, but you should not overlook the art of building loyalty. There are a few key ways to build your loyal following and get your customers to become advocates for your store and bring in more customers. Here’s how. Email marketing has one of the highest ROIs of any marketing strategy. Litmusstates that the return on investment for email is 38:1. That means that for every dollar you spend on email marketing, you’ll get $38 back when you employ a winning email strategy. Your email marketing strategy starts with an effective way to gather email addresses. One way of doing this is to ask at the point of sale for your customer’s email address. Teach your staff how to seamlessly add this as a part of their processes and add a field to your computers so that they can input it right there in the sales process. Another way to collect email addresses is from visitors to your website and social media. On your website, place a subscribe box prominently on every page. This could be in the footer or along the right sidebar depending on your website’s format. On social media, post from time to time inviting your audience to subscribe to your list to receive helpful content. Your email marketing strategy should include regular touchpoints with your email subscribers. You don’t want them to forget you or wonder how they get on your email list. Regular campaigns can keep you in contact with your customers and allow you to stay top-of-mind. At the same time, you don’t want to just email your customers without purpose. So think through it strategically and have a content plan. Use email to announce new products, share blogs and provide industry updates. Make a habit of reminding your customers to come back to your store when it's been a while. To do this effectively, you'll need to have a way of identifying your visitors each time they purchase in store. You can do this with a loyalty card but realize that promotions for handouts of drug paraphernalia are highly regulated. Building a loyalty program can take some added creativity, such as giving out apparel or other non-drug related item. If you build a loyalty program, make sure you have the marketing tactics in place to make it worth your time and money. Your point of sale system should integrate with your email marketing system so that you can automate your visit reminders when somehow hasn't purchased from you within a specific timeframe. Welcome your customers back with print mailings. To do this, you’ll need to collect addresses or plug into a database of information. Postcards and mailers can help remind your customers about the service you provide and welcome them back in store. Postcards are nice because they cost less to mail and allow your message to be front and center when sitting in a customer’s stack of mail. Use strong imagery and catchy headlines to pull your customer in to read your mailing. If you’ve recently opened your store, you can do a mailing in your neighborhood to announce your business. Because you'll need to tap into a marketing list to get the addresses this isn't the most inexpensive strategy for bringing in customers, but it can serve as a good introduction when you can afford it. At this point in the guide, you should be well aware of the critical role that your website plays in your marketing strategy. Building your website should be strategic and focus on SEO and getting the right content out there to help people find your store. To help you in your website development, we’ve ranked and critiqued some of the top websites. Online marketing strategies for cannabis websites. The Farm features its products front and center on the homepage, so you know what they have to offer. From edibles to the different types of cannabis, the main banner shares information about all they have to offer. While online sales of marijuana are prohibited, the site allows you to preorder your products for easy pick up in store within 24 hours. The website has regular checks to make sure its visitors are 21 years of age or older. On its pages, the website features its blog articles along the right side of the page. Cannabis marketing needs to include a strong foundation of a good website. Local Product features a large banner on its homepage with three buttons for the most common navigation that visitors use. Below that, the site helps you navigate according to the different reasons you might use cannabis, from recreation to medicinal. Below the audience types is information on the different kinds of cannabis the store offers so you can familiarize yourself with their products and click to read more. On the footer of every page, the store lists out their address, phone, and email address so you can get in contact with them. Sacred Seed puts its contact information front and center on the homepage alongside its hours in the upper right of the page. The website features a blog with fun and engaging content about events and challenges. The blog posts are somewhat sporadic, which is an area of opportunity for the site. It also features information on changes in the industry and helpful information to guide the usage of cannabis and CBD. Technology powers marketing insights and advertising strategies through data and analytics. The right technology can make all the difference in how you market your cannabis and CBD business. Here’s a look at some of the software and technology you might want to invest in. Cybersys POS has a variety of pricing plans to meet the needs of your business according to size and sales. You can use the system on mobile devices, which is excellent for having flexibility in how you run your business. You can manage what employees have access to the system and do an audit for how they’re using it. 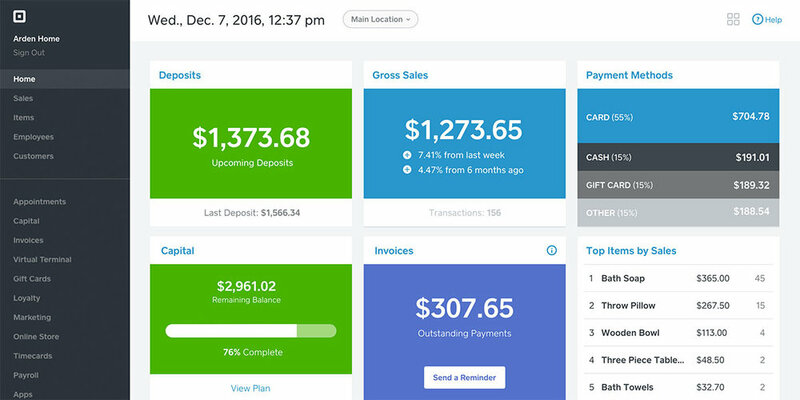 The system also provides sales insights and help with accounting. Square POS for marijuana and cbd companies best software. Square is a free service that you can get on any device. With a magstripe reader, you can readily accept credit card payments. Additionally, the platform can help you manage your inventory and help you track your sales so you can see how you're doing financially. The analytics the point of sale system provides help you know how to run your business and what's working well for you. See how many of your sales are credit vs. cash and what kind of credit card fees you're currently paying so you can see a holistic view of your finances. Vend offers an easy and efficient point of sale platform.You can manage your sales and customers to see where you’re at and where you have room to grow. If you offer an online store for selling apparel or other non-drug items, you can integrate this system with your online store. 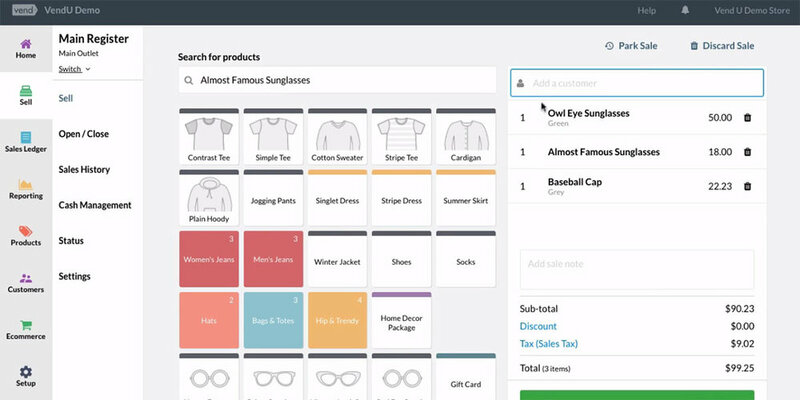 Manage your customer information and product catalog and inventory all in one place with Vend point of sale system. It works on iOS devices and desktops to give you the mobility you need to run your business.